Airplane passenger UFO sightings account for a large number of reported UFO encounters around the world each and every single year. It has been estimated that at least once every three minutes, someone in the world witnesses something in the air that they are unable to identify. Statistically speaking, it is quite likely that pilots and those that travel by air frequently are those that experience the sightings more so than anyone. In the earliest days of commercial aviation, pilots would openly discuss the firsthand experiences that they had with unidentified flying objects. However, as time progressed, airline companies enforced rules that would keep pilots from revealing such information. While it is true that many airline companies are quite sensitive when it comes to UFO sightings by their pilots, the passengers do not have to be as sensitive. Every single year, there are numerous airplane passenger UFO sightings. However, intelligence committees established a ruling in the year of 1954 that all pilots must refrain from releasing information of any UFO sightings and other events related to UFOs that were experienced during the course of their professional duties. The reason that this ruling was put into place is that the Military Intelligence group of the Federal Government stated that UFOs "represented a serious problem", and the airline companies were asked to, and I quote: "cooperate". One of the most popular of the airplane passenger UFO sightings happened on July 4th 1947. United Airlines had a flight that took off from Boise and was due to land in Seattle. The pilot of this aircraft, the crew, and the passengers observed two different formations of UFOs. An estimated four hundred people on the ground also witnessed this event. The most common report was that they were oval shaped and traveling at high speeds. The year following this event, the Eastern Airlines flight of DC 3 had an unusual run in with a UFO. 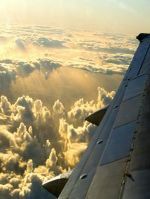 As it was traveling to its destination, a flying craft that was unknown to the pilot and the crew of the airplane witnessed a bright craft with window that were extremely bright. Within minutes, the UFO nearly ran right into the airliner. In the area of Washington D.C an airliner identified as a Pan Am DC 4 observed six various UFOs moving at particularly odd speeds and angles around their airplane. Not too long after seeing this unusual aircraft behavior, the airplane passenger UFO sightings indicated that the UFOs simply vanished - with no trace. While this represents only a small section on airplane passenger UFO sightings, you can quickly see that many flying onboard the airliners have observed strange and unusual events in both the day and night sky. Are UFOs real? The answer is likely "yes". Should we cooperate? If the Military Intelligence believes so, then the answer to that is also "yes". Are UFOs one of the world's greatest mysteries? That is a definite "yes"!